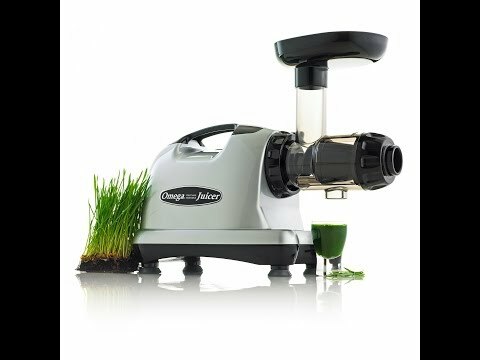 The Omega J8226C is a cold-press juicer that doubles as a living food processor. Capable of extracting fresh healthy juice brimming with nutrients, the J8226C also makes nut butters and milks, soups, baby food, fresh pasta and frozen desserts. The Omega J8226C is the perfect purchase if you are looking for more than a simple juicer (read our Omega Profile here for more on the brand and its technology). The Omega J8226C is equipped with a motor tuned to 80 RPM - this slow masticating speed ensures minimal heat built-up (oxidation) and minimal foaming. The dual-stage juicing gives a higher yield and fresher flavour, as well as maintaining phytonutrients alive to deliver a juice full of minerals, enzymes, antioxidants and vitamins - a living juice! The Omega J8226C is a user-friendly juicer that assembles and disassembles quickly and is easy to clean. Its continous pulp ejection means you can juice without having to start and stop frequently. The built-in reverse function minimises the chance of clogging during operation. The Omega J8226C has the same features as the Omega J8006 but is designed for Australian voltage. Spare parts for the Omega 8226 are available on special order, you can click here to fill out an order request form. The left-over pulp from your nut milks or fruit and veg juices can be incorporated into muffins or bread loaves, which will increase the amount of fibre in your diet but also reduce the amount of waste in your kitchen! Download the 8226 Instruction Manual here. 20 years on motor, 10 years on parts (supported by a warranty and repair centre located in Queensland, Australia).
! Please note the warranty period mentioned in the video is for the US market, please refer to the warranty quoted above !